As a web publisher I used to try new new advertising people to fill my inventory and to get extra Income. I have started my publishing or web site work as a hobby. I have tried commission junction and other agencies only to find out that web money is a myth, until I tried google adsense. I have tried kontera and infolinks for my website since their advertisements are text links which will not consume out traditional ad-space If I am right kontera was the first one and infolinks came after. So I have tried kontera two times. One before info-links and one recently. Are you jokers or do you think I am a joker?? I have found out that lot of people are asking same question which one we should try. I recommend them to conduct a search on internet to find out, read about others experience. But most importantly test both of them for some time so that you will be convinced. means I am getting 0.02 for 4500 impression. (As if they sell their inventory for 0.005/cents 1000 impression if you are calculating CPM. 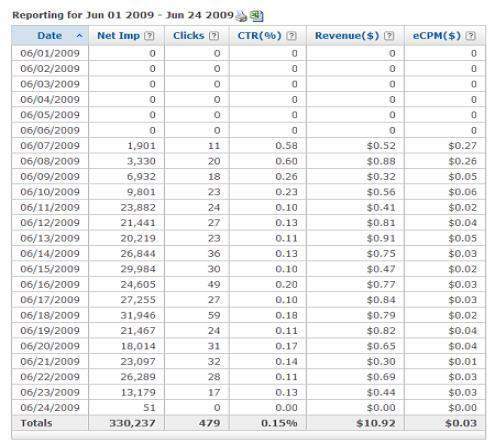 08/13/2012 4,542 13 clicks $0.02(Revenue). Where as infolinks pay me average $ 0.2/per 13 clicks. Can you please explain why you pay so disastrous compensation for your publishers??. It was obvious no advertising company in the world will take advertisements less than 1 cents/click. Atleast as per my knowledge. Which means They are taking around 85% of money (minimum) and giving us dog bones. Thank you for contacting Kontera Support. I reviewed your account to make sure it was placed into all relevant pub groups and made a couple optimizations to your account that will hopefully generate more revenue. However, one issue that might be happening is that we may not currently have a lot of inventory for the topic of your site. We do have a number of new campaigns going live soon, so hopefully that will also help increase your revenue. So I think for me infolink, kontera is same side of a coin. You can try Kontera yourself to find out which is the best in between them. As of now I have not tried adbrite textlinks since I was fed up with their low performing banner advertisements. But please note that adbrite also were running the same type of advertisements (now they closed). Vibrant media is also there in scene. Remember less performing or more performing is not big issue as we may have to fill our inventory with low performing advertisements. But it is really hard to accept bones from some body who has taken all the flesh. For me 2 cents for 13 clicks was the lowest in my web publishing life. 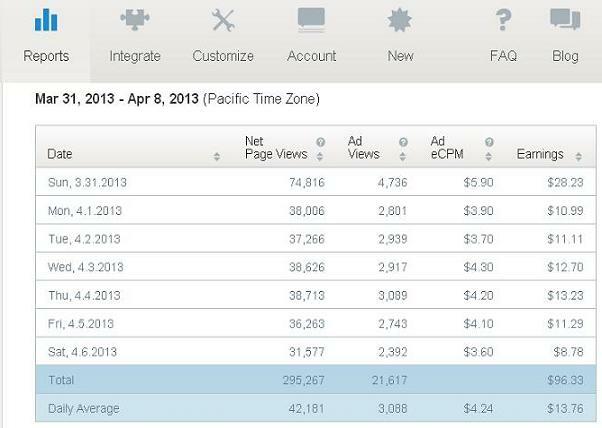 I’m not going to sell any more of my pageview for 1c eCPM (that’s 1000 impression for 1 cent). I had to make a cruel decision, and pulled out Kontera ads from my site. Kontera’s aim has always been to provide partners with the highest quality technology and to to deliver the most targeted ads at the best rates. With this in mind, we’ve been in the market for years, offering the best In-Text Ad solution to publishers across the web. There are many optimization measurements that can be used to to bring cpc back up. We are always glad to advise and to make changes on our end as well, in order to help publishers make the most out of in text ads. With regards to changes in cpc, they are often due to changes in traffic source. It’s possible that a site received the same number of clicks, but as the traffic source changes, so does ppc. MIKA , please stop the copy & paste of the same answer always regarding the very low earning issue. you want publishers to stick and keep working with you ?? stop paying very LOW. make the clicks earning more than 0.01$ and see how many publishers will use you, everybody is complaining about KONTERA low earning. With above search result it is obviously clear that kontera users want to remove their ads or disable kontera ads. They may be considering it as nuisance or a burden since it is not paying them any money. When people search for infolinks vs adsense we can come to a conclusion that people are thinking whether infolinks is a viable alternative to adsense. That is very important. Normally all publishers are considering infolinks and kontera as supplementary Income. Search term disable kontera (58) and disable infolinks (58) is having exact number of search volume. 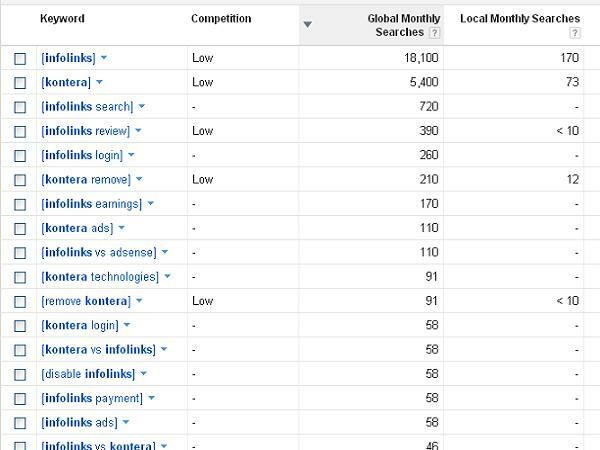 However we should not forget that infolinks search volume is 18000 and kontera search volume is 5400/month. My personal recommendation: I recommend you to test each program for yourself. Some time the demographics of websites will change the behaviors of advertisements earnings very much. So better to test yourself before doing any conclusion. The above blog post is my personal experience only and it may not be same for your websites. Declaimer: The above post is written based on my experience. The internet and web world is constantly changing. So teh results may change from person to person and time to time. With my personal experience and reviews I have read, I recommend you to go for infolinks. So please note that I do not have favour or bias to any advertising network. This is Jonathan from Kontera. First of all, just a real nuts and bots clarification – Kontera publishers can see their previous Kontera earnings dating back six months, not three months, from their Publisher Centers. Publishers who want to see their earnings dating back from a longer period of time, or want to check how close they are to their next payout can do so by contacting our Support Team at ([email protected]). Also, one quick preface, I looked at your Kontera account and your website (hidden) featured content that was also on websites like thehindu.com. One of our publisher guidelines is that your site needs to “contain original content, not repurposed content”. So this site in particular was never a good match for our platform. Speaking in more general terms Kontera is primarily a brand advertising platform, meaning we work directly with some of the biggest brands in the world like Microsoft, CBS, Audi, Kellogg’s, Verizon, Intel, and more. These ads are the most attractive, offer the best CPC, and perform much better than networks that rely primarily on generic ad feeds. That said, it’s up to our advertisers where they want their ads to appear, and if your content isn’t on topics they’re targeting or in your traffic isn’t coming from regions they’re targeting, you’re not going to see the same level of differentiation that most Kontera publishers experience. Take (your site) for example, it looks like most of the traffic from that website is coming from India. If most of the traffic was coming from say the United States, odds are the majority of ad clicks you’d get would be on brand ads, and you’d see much better performance. While you get a 70% revenue share no matter what, it’s important to keep in mind that not all ad clicks are worth the same amount of money. Kontera offers advertisers a variety of different in-content ad units, most of which are priced slightly differently based on the complexity and features offered in the unit. Additionally, most ad networks use ad feeds to supplement their inventory on content they don’t have the right ads for and those ads are almost inherently pay less to both the ad network and the publisher. For instance, if you’ve been using Infolinks you’ve probably noticed in the last six months that they stopped showing ad clicks in their publisher data. Based on what I’ve seen people writing in forums the past couple of years, I guarantee you the main reason they removed that is because they got tired of explaining to publishers why they kept on getting clicks that were worth less than a cent. There isn’t a single ad platform that’s right for all publishers, and after looking at your site, I don’t think Kontera was the right fit for you. However, for publishers that are a good match for brand advertising, they will see better results using Kontera. One last aside, you mentioned AdBrite also provides in-content ads. They actually went out of business a few months ago. 2. Thanks for highlighting adbrite is gone out of business. Anyway before highlighting this please have a look yourself at mirror. Mirror is located at http://www.alexa.com/siteinfo/kontera.com#. 4. You work with biggest brands in the world like Microsoft, CBS, Audi, Kellogg’s, Verizon, Intel, or with anybody or do brand advertisements or brand awareness or whatever. But to display your advertisements on our network we need money (not 0.15cents/click). 1. I noticed after I left my first comment here that based on a support ticket you opened in the past with us the website you might be referring to is xxxxxx.com. While it’s possible that you might have another Kontera account I’m not aware of, it’s important to keep in mind that your Kontera tag is only supposed to go on the specific site it was approved for. If a publisher would like to add Kontera to an additional one of their websites, they can e-mail either our Support or their account manager, and if applicable, they’ll provide an additional unique Kontera tag. The approval process is important because it protects our advertisers from their ads appearing over inappropriate content, and is important for publishers, as we can save them time by telling them upfront that they wouldn’t be a good match for Kontera either for content or performance reasons. 2. In terms of Kontera’s Alexa profile, I’m not 100% sure what you’re trying to draw attention to, but I’d just point out that in terms of our business model, success has a lot more to do with our platform being used on other websites, not getting people to visit our own. Almost all our interaction with advertisers happens off the website, as well as much of the interaction with our 15,000 + publishers. 3. Regarding revenue share, I understand your frustration but you are actually getting 70%. I do think however that a little more context would help you understand what’s going. The market for brand ads is hotter than ever, but around two years ago, advertiser interest in ad feeds began to drastically reduce. On Kontera these ads would appear, when relevant, when we didn’t have a relevant brand ad to display over your content. Other networks which didn’t have brands ads, which provide much better CPC, relayed either primarily or exclusively on these ad feeds for their ad inventory. For instance, I saw in that Digital Point forum where you advertised this post that a publisher who was seeing $7.00 eCPM last year through Infolinks is now seeing $0.50 eCPM through them. That decline is most probably related to advertisers putting less and less of their budget into these ad feeds. For Kontera publishers in general, that’s much less of an issue as we’re a brand network, however as I said before, if you’re not receiving brand ads either because advertisers aren’t targeting the topics of your content or the region of your readers, that 70% revenue share is going to come from a significantly smaller pie. Not just compared to our premium brand ads, also compared to a couple of years ago for non-brand ads. Concerning advertising with Kontera, you’re welcome to inquire, just keep in mind we’re not a self service ad platform. In terms of scale, we’re currently only accepting new campaigns where the spend is $20,000 or more. But again that’s on the brand advertising end, the whole problem in your case as a publisher is you’re not receiving brand ads. 4. Speaking to your final point, I agree with you, that based on the two websites of yours that I’ve seen, that Kontera isn’t a good match, either from your perspective or ours. That’s fine, in the time I’ve been working at Kontera I’ve seen us turn down a significant amount of publishers and advertisers, some who were looking to spend a significant amount of their budget, just because for various reasons the partnership wasn’t a good fit. We perform incredibly well for most of our partners, but if your readers aren’t eligible to see the brand ads, that likely isn’t going to be the case for you. Whatever may be the reason at the end, monthly earning only important. No body will think did you refused advertisers or publishers and what is the minimum budget etc. Investors need profit and return to their investment. For us also same. How much I earned and who is paying more. and where all I can sell my inventory. And paying for 4500 page impression and 13 clicks only 2 cents and you expect people will take it. After reading your comments I thought it is fare to do one more study, even if I loose some money. (for one week I lost around $40.00. Any way study reports and some suggestions are there as a publisher. In-fact I again tried last week now you are paying 5 cents/clicks. Is the sky has fallen down or all my audience migrated to USA?? yes, infolinks are good I agree. And that is why I never heard of kontera, explains alot.